Don’t be afraid to learn from the others around you: you’re not in competition. 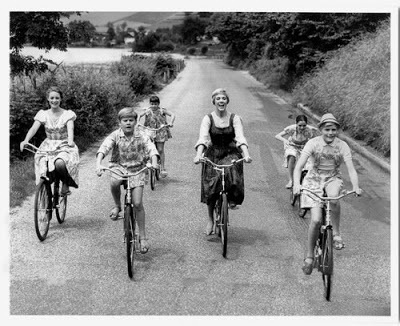 For example, observe the slower cyclists – take a moment to enjoy their pace. Equally, if you feel lacking in motivation, use the faster cyclists as markers to keep you going! Play around and get to know where your true level really is, then enjoy. Notice how you might tense/relax in different situations. Do you relax downhill? Immediately grit your teeth on spotting an uphill? Notice how these reactions may impact your cycling. Approach all with love. I commute by bike every day and spend 2 hours a day next to busy, London traffic. Everyone is just there to share the road, not to antagonise or disrupt your life. It is of course true that accidents happen and people can be careless, but approaching situations with love rather than aggression goes a long way to ensuring your safety. Hold for a moment. Take one full minute to stop in your journey – in a park, or somewhere you find attractive. Breathe and scan through what you are grateful for in this moment. It will transform your commute! Pull in your abs, relax your shoulders down and lengthen your spine: I am struggling with this one big time, but I’m still trying. This really helps your posture and keeps you riding steady. Be conscious of your face: Are you grimacing or smiling? Headache? Jaw-ache? Take note without attachment. The more you notice, the more you become receptive to subtle changes in your nervous system and this is where you gain control. Use relaxation time wisely: Every moment on your journey counts. In class, when you’re invited to be in savasana or child’s pose for a few moments, soak that luxury up! Similarly, every time you reach a traffic light, use that time to do something lovely and pampering. I like to swirl my wrists and give my arms a shake, or do some head rolls, or the ultimate: hold my hands behind my rucksack and do a gentle, uplifting backbend. Learn from the Warrior and accept that you are allowed to take up space: For some this isn’t a problem, but for others, it can feel strange taking space for themselves. Signal strongly and confidently. Take ownership of your space – you don’t have to be aggressive: the warrior is humble, steady, and balanced. Drivers and other cyclists will appreciate your clear communication. If you feel you’re being ignored, get yourself some high-vis equipment. High vis gloves are a must for people to see you signal clearly, or at least a high-vis jacket with long sleeves. Balance effort and surrender: Time for an experiment! Try one cycling journey or one yoga class (or both) where you’re making 100% effort all the way through. Then, do a class or a cycle (or both) where you’re balancing striving for results with enjoying and surrendering to the moment. I discovered that finding that in-between place really hits the spot – it requires constant focus and inquiry but it’s so rewarding once you find it. Also, I seem to make the same time in my commute whether I race along sweating and huffing or just take it easy, and I know which one I prefer! Ride like you mean it: yoga teaches us to honestly approach situations, to remove the illusory veils that shroud our view and practice integrity. Be honest with your cycling. Cheeky moves like skipping lights or undertaking will only attract negative things for you. Accept that you are quite vulnerable balancing on two wheels and take care of yourself when you’re enjoying your ride. It’s totally fine to pretend you’re Sister Maria from the Sound of Music: Lets face it, this can apply to many areas of life – Sister M knows how to enjoy life. Singing is definitely an activity worth matching up with cycling (by the time you’ve whizzed by no one can hear you anyway), as is smiling. Do you enjoy happy-baby? Smile during this pose! It will make you feel fabulous. Next I gave up coffee… HELP!!! Mostly I have been cycling as before, but its very cold in London now so I have noticed some changes; it gets darker & road users are slightly more agitated-it pays to be extra cautious. Also I’m wearing little booties & gloves to keep from freezing! Tbh I didnt cycle for a whole week for various reasons & I miss it very much. Its such an important part of my exercise routine that to go without it leaves me feeling like a sluggish, lazy lump! Why dont you like cycling, may I ask? I always loved the feeling of freedom it gives; when you’ve got the right bike/road it feels like you’re flying!